- ( Photo Etching ) Have your photo permanently laser engraved on marble or wood with high detail! Don't settle for the stamped out everyday gift when you can amaze them with a laser engraved personalized photo gift that will last a lifetime. Design your custom layout online, upload your image, add text, or add color with a gold / silver inlay into the text of your choice. Looking for a unique funeral keepsake? Remember your loved one on one of our non-fading marble, granite or wood memorial plaques. 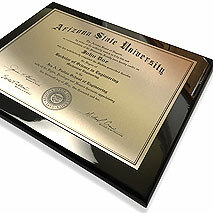 Each plaque is custom tailored to your needs and designed all online. Simply upload your image, add text, select your font, add a border and if you wish add color to the text of your choice with a (optional) gold or silver inlay. To complete your order, add a wood or ornamental iron easel to display your piece. Choose from three types of memorial plaques including marble, granite and wood. If your looking for an unique, timeless personalized wedding gift look no further. These gifts are sure to drop jaws and are designed to last a lifetime.